The main difference is that the RegEx for BREAK_ONLY_BEFORE is more strict than the default log4j configuration, so timestamps in the middle of an entry will not cause a new entry to start. As the events began to fill in I created two field extractions on my Splunk search head; one to tag the usernames and the other to tag the client IP addresses. I also set the permissions so that both fields would show up in all apps. 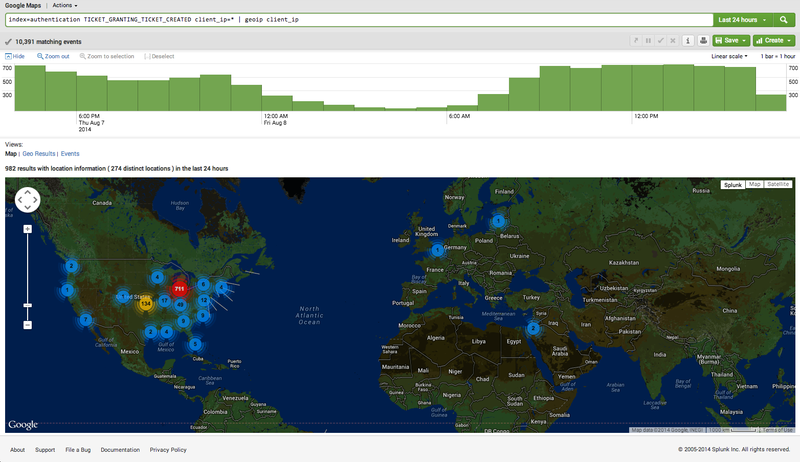 Next I installed the Google Maps App from https://apps.splunk.com/app/368/ onto each of my Splunk servers. This not only provides me with the ability to plot points on a map, but it also gives me access to the MaxMind GeoIP database. Once it was installed the ‘geoip’ command was still not working. After some research I found that I needed to edit ‘/opt/splunk/etc/apps/maps/default/geoip.conf’ to change the path to the GeoIP database file. the absolute path seems to be required. With that everything should be in place to run a query. From the Splunk search head I opened the Google Maps app and entered the following command. I chose ‘TICKET_GRANTING_TICKET_CREATED’ to return only events where the user is logging into CAS with their username and password, client_ip=* to avoid any errors where the client_ip was not present, and then I simply piped it into the geoip command to return the following data.